Now is the time to stop wasting your energy on limited propriety software, and implement an on-premise cloud solution that offers flexible and functional solutions to securely optimize your organization’s infrastructure. OpenStack Private Cloud offers the functionality, flexibility, and support needed to build out and manage the type of system you require to properly manage your complex, sensitive data while increasing performance and reducing overall costs. So, what exactly is OpenStack? OpenStack is a collection of open-source software tools, components and services that allow enterprises to build and manage an automated cloud infrastructure through public and private clouds, as well as utilize customizable resources with on-demand network access for mission-critical workloads. Due to the sheer amount of options for configuring highly-scalable resources with OpenStack’s ease of implementation, enterprises encounter substantial cost savings as well as an incredibly agile system that is able to change rapidly with organizational growth. OpenStack private cloud and public cloud infrastructures fall into the Infrastructure as a Service (IaaS) category, and provide comprehensive, self-service solutions with features such as: customization of virtual machines, processing, servers, networks, middleware, services, data storage and the ability to run operating systems and software applications. These capabilities are offered across Private, Public, or Hybrid deployment models that allow for creation of flexible infrastructures and meet the needs of organizational applications and workflows. Private Clouds are used exclusively by a single organization, and the on or off premises infrastructure may be configured or scaled to meet the client’s needs. Security concerns differ due to the incredibly diverse possibilities for private clouds. Public clouds are usually hosted by a service provider, and are open to the public for usage. Entities such as businesses, educational facilities or governmental organizations typically manage the infrastructure. Public clouds are usually more risky due to their open nature. Hybrid clouds are usually a mixture of private and public clouds that offer more flexibility, application portability and deployment capabilities for organizations that need both the open nature of the public cloud and the more secure nature of the private cloud. The rise of the software-defined economy is driving major changes in the way that organization’s build and maintain their infrastructure, while trying to uphold compliance regulations and stay on top of security standards. An OpenStack private cloud solution is the logical solution to this problem due to its incredibly elastic capabilities, highly-scalable resources, on-demand services, broad network access, resource pooling features, measured services, and cost-effective strategies. The construction of an on-premise cloud solution allows for more control over security measures and gives the organization the ability to personally deal with the protection of their client’s data. Plus, this type of system is incredibly resilient to data loss and can tolerate multiple failures, which helps keep your business running at all times. As your business grows and requires a more static infrastructure, an OpenStack private cloud becomes the most cost-efficient option because it does not come with complicated and expensive software licensing schemes. This allows enterprises to deploy a flexible and scalable cloud computing system that fully optimizes the organization’s hardware and software requirements without software licensing fees, vendor lock-in, or compatibility issues. OpenStack private clouds also allow a reduction in system management obligations due to the innumerable automated tasks, which allows users to spend more time where it is needed most and reduce the demand for helpdesk support. Faster deployment of IT resources allows you to spend less time setting up and manually managing servers and machine installations, which cuts down time-to-market and enables rapid innovation. 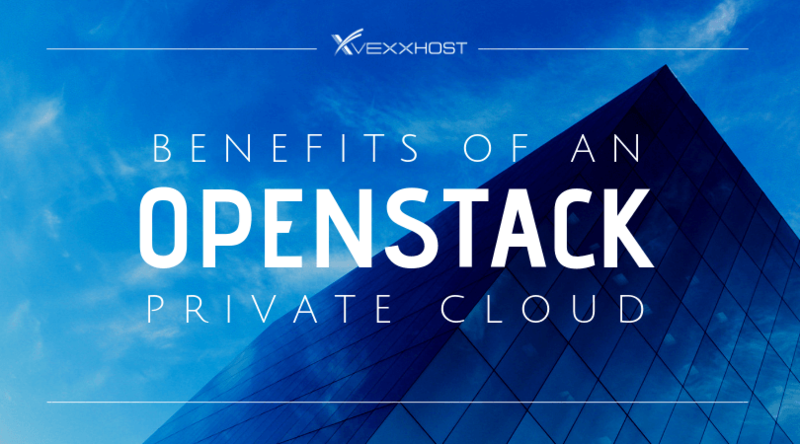 In addition, OpenStack private clouds allow for specific customization of almost every feature affecting the virtual machines incorporated into the system and allows for the development of new features to enhance the specific needs of the organization – giving them a significant competitive advantage. One thing to note is that there is no one single OpenStack implementation strategy that fits all business models. Each infrastructure is specifically customized to an organization’s specific needs and requirements for eCommerce, enterprise apps, big data, digital media workflow, high performance computing, IT-as-a-service, network provisioning and web services. And, this provides enterprises with a resources on-demand system that matches their exact needs without the paying for non-essential elements that often come with a proprietary system (AWS, Microsoft). A comprehensive cloud strategy is crucial to leverage the incomparable agility, efficiency, and innovation of the cloud to enhance your growing organization. So, what is the ideal path to a cloud solution for your specific organization? Knowledge and operational experience are the most important factors when determining the appropriate infrastructure to suit your requirements, and VEXXHOST works exclusively with OpenStack managed services. Our experience and expertise with OpenStack products and solutions is unparalleled, and our consultants will work with you to assess the suitability of your applications for the cloud, select the right platforms, and define a cloud strategy and roadmap for transformation and growth. VEXXHOST is committed to working with its users to help architect, configure and optimize their cloud infrastructure to reduce expenses and increase productivity. Our managed OpenStack private cloud includes a comprehensive suite of solutions that ensures a secure, up-to-date and fully monitored cloud. VEXXHOST also delivers a high level of expertise to help a client’s upgrade their existing system, optimize cloud infrastructures or implement OpenStack components such as compute, network, object or block storage, orchestration, load balancing, big data, file sharing, cloud images, container services and more. We even provide complete end-to-end planning, architecture, and best practices support. We place great value on timely OpenStack updates and bug fixes as soon as they become available, and we implemented the Queens release on all our clouds within less than a week of the release. Plus, our power efficient, green datacenter, located in Montreal, QC, Canada, can tolerate multiple failures which ensures that your data will continue to be accessible in disaster situations, and all of your data is located in a secure SSAE-16 facility which has undergone SOC Type 2 audit. VEXXHOST does not come with complicated and expensive licensing schemes, and we offer highly-competitive pricing through our fully open sourced systems without any proprietary licensed technology. This allows you to flexibly deploy your cloud in any way you need at no licensing fee. Our experts possess the knowledge and experience to identify and work with a wide range of OpenStack infrastructure-related issues. We are corporate sponsors and infrastructure donors for the OpenStack infrastructure team. We are not just another vendor, we are your partners. Click here for more information on our private cloud solution.